I love tarts and pies and quiches. Who doesn’t? But most recipes for all of the above include (or at least used to include) wheat flour. As I avoid wheat flour completely and try to avoid other gluten flours as well, I am in constant search for alternatives. Doing so, I came across this recipe and decided to give it a try. As you can imagine, it turned out to be delicious, otherwise I wouldn’t have shared it with you. So here it goes. 1. Preheat oven to 180°C. Grease a removable bottom fluted tart pan. 2. To make tart base, place quinoa and stock in a small saucepan and bring to a gentle boil. Cover and cook over a low heat for 10-15 minutes or until all liquid has been absorbed. Remove from heat, fluff with a fork and let cool for 10 minutes. Then mix with eggs, parmesan and season with salt and pepper. 3. Transfer mixture to prepared pie dish and gently press mixture evenly into the dish, including the sides. This is best done by covering with baking paper and using your hands. 4. Bake tart crust for 15 minutes, or until just starting to brown. Remove from heat and set aside. 5. To make filling, heat a non-stick frypan over low-medium heat. Spray with oil, add onions and thyme and cook for 5 minutes, stirring regularly. Add mushrooms and garlic and cook for another 5 minutes. Season with salt and pepper. Remove from heat and set aside. 6. In a separate bowl, blend cottage cheese, yoghurt, lemon zest and salt and pepper. 7. 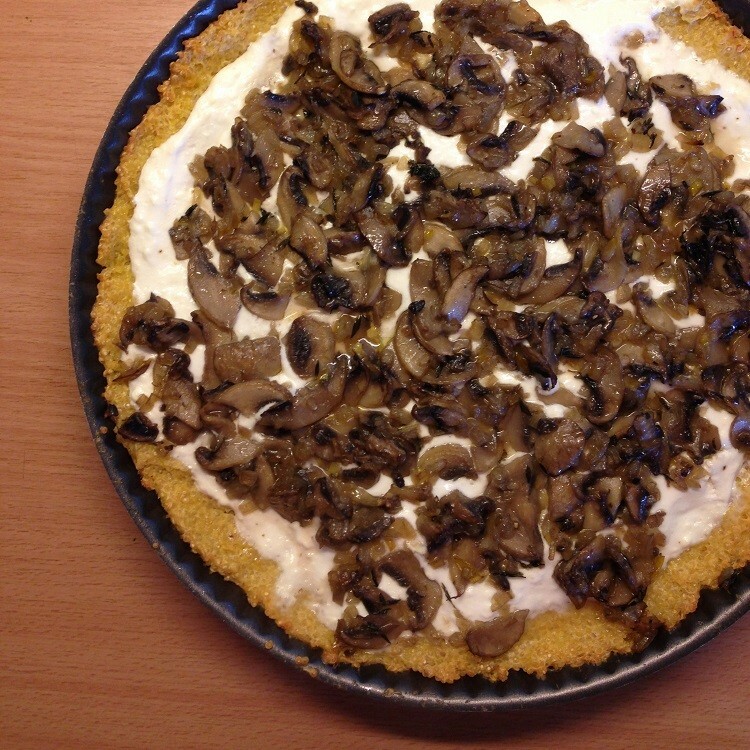 Spread cheese mixture over base of tart, top with mushroom mixture and bake for 20-30 minutes. 8. Rest for 5 minutes before serving.